I am a “Dogfather”. It is a common error with folks with dyslexia. My charge is a noble black beast named after fierce competitor Mia Hamm. It seems that Mia does not play well with others. Like her namesake, she keeps her mind on the mission. Then again, how many of us put on our better self all the time. Who is to say what is the better self any way? There seems to be expectations put upon dogs that some dogs just do not want to buy into. For example, Mia is fiercely loyal. I appreciated that trait. If Mia were a member of the armed forces, she would be a Marine. Standing by my side, I feared no evil for I had Uncle Sam’s misguided canine. So in an effort for some mutual attitude adjustment, I took Mia out for a hike on a trail that runs out from Mt Seymour in North Vancouver. The trail is called “Dog Mountain”. Mia and I arrived at Mt Seymour with little hope of seeing anything. A fog had capped the summit and tourist were disappointed that Mother Nature had once again pulled some form of moisture from her bag of trick. After finding the parking lot and applauding crazed cyclist that were pedaling up to this ski resort, I started asking folks which way the trail was and was thankfully given direction by a great guy who had inherited two rescue dogs. He had referred to his hound as “Mutts” but I looked at the two pups and said, “These are not mutts. They are universal dogs. This is what you would get from a great combination of most of the dogs on the planet!” One hound amazed his owner and licked my hand. A dog knows when it is appreciated even though it has been labeled as shy and abused. The man’s wife, who was distinctly pregnant, seemed to like that. No longer “Mutts” but an elite hybrid..the universal dog. Gold and shorthaired, with strong legs and a lean body of a cross between a grey hound and a golden Labrador , with happy floppy ears and a curled up tail, yes these dogs were the product and a fast and frisky mating. As heart warming as this little interaction was, Mia was not going to be part of this love feast. She looked out the window of my truck and startled to snarl. So with leash, walking stick (possibly to fend off that one crazed Doberman) the mission was a foot. 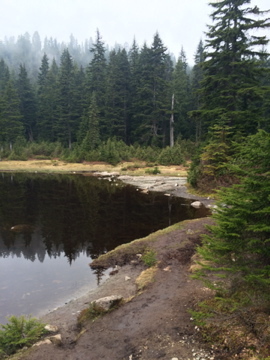 In local hiking guidebooks and a North shore website, the Dog Mountain trail is rated as an “easy” trail. There are some side comments about the possible challenges of mud on exposed roots. With this in mind, Mia and I marched into the woods, our shoes and paws crunching gravel with a solid cadence and a simple intent to set off and test our social skills. Prior to this hike, I only wanted to rediscover a joy of my own youth. As a moody thirteen-year-old New England, I was lucky enough to be taken under the wing of a scoutmaster who had just returned from Viet Nam. He was a Marine and some how the whole Kumbaya scout lore and merit badges got prioritized to focus on survival and a simple code of honour, courage and commitment. At the time, colour TVs were telecasting fresh footage from the rice patties and all my scout master wanted to do was make sure we would not become a statistic. So we hiked. Actually, we marched. We spent several weeks on the Appalachian Trail doing a fifty-mile hike that evolved into many more miles just for the sake of doing patrols. We learned to survive on dehydrated food and the stray bullfrogs that ended up on spears we made. For an imaginative and fit teenager, I thrived with the intense training. I also found the woods as a place of solitude to get away from the madness of being a teen. My other mentors were my own hound “Mike” and a Irish setter, who we named “Red”. I was later to find out his name was Lancelot, which seemed gallant and Arthurian but the name did not match his goofy ways. Like Mia, my dog “Mike” was a natural fighter and loyal. Hiking with a hound in those days was less demanding. The dog bag was not yet invented and the leash was something you had just in case a pack of joggers or bicycles went by. Let’s be honest here, what dog can ignore a mass flock of moving objects? Be it a bunch of geese or a flock of sheep, the primal urges kick in. Dogs like to chase things, just like kids like to play. It is a way to create joy and it does not need to be muzzled nor drugged into stoic silence. 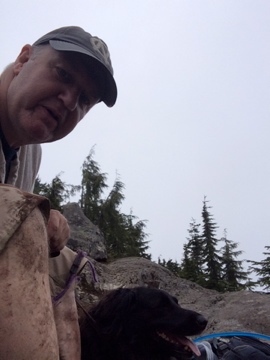 So it was, that a mindful Marine and malicious mutts oddly fostered my joy of hiking. Well, Mia’s primal urges to protect instilled a new role for me. Gone were my previous intended meditative reflections, I was loud and proud, “oorah!”. I was like a knight’s errant shouting into the crowd. “Behold the brave knight Mia, please put your dogs on a leash!”. “Move aside maggots”, there is no time for mental hamburger, remember “Heartbreak Ridge” and get your arses up this mountain. At one point in our journey, a German Sheppard made a lunge on Mia. Instincts kicked in and I fell to the mud to cover Mia from the attack as if a hand grenade had just come rolling down the hill. Covered in mud, I wrestled with Mia to protect her from locking jaws with this beast. Notes to self, this was a breed to remember. There was definitely no happy wagging of tails nor polite sniffing of hindquarters. Marines have a selective memory and so do dogs. I must confess that Mia was quite patient with me. We went over narrow logs and she just looked at me and jumped off and traveled through the mud. Like I said, she is a Marine. We scrambled up inclines of vines after I announced to the woods that any stay dog should be on a leash. Several hounds passed by. Owners looked at me like I was crazed. Some applauded my intents to domesticate an obviously aggressive dog. There were several hesitant looks and smug stares that seemed to say “How dare you bring that uncivilized hound into our humble environs”. I began to understand Mia’s reluctance to become that calm dog on the leash. I wondered what would happen to these folks if some stray bear or cougar came wandering down the hill. Then what? I could hear Jack in my head..”you want the truth! You cannot handle the truth! Secretly you want us on this trail. You want us because we can guard you against those wild thing you fear? Yes.. you.. in your luluman yoga pants and fricking Birkenstocks. Where the hell did you think you were going this morning? Thought you were off for a quick latte and a pop into the mall? Half awake and buried deep down in your designer clothes filled, custom made, Cherry wood multilevel Bauhaus closets, you hide and cower each morning at the fear of being uncoordinated and not politically correct. Truth, you cannot handle the truth!”. With a paw to the left and a walking stick to the right, Mia and I quietly (with an occasional snarl) pasted the oddly adorned “hikers” and soldiered on through the now thicken mud and slippery vines. So Mia and I were both now on a mission to “improvise, adapt, and over come” this whole North Shore hiking thing with a happy tune in our heads. With each meeting of muzzle to muzzle encounters, I looked at Mia and said..”you are getting better” and like wise as I manage to quicken up my pace and climb up woody inclines, Mia looked at me like a Drill Instructor and gave my a modicum of hope that I would actually get out of these woods without teeth marks in my arms or a broken ankle. Together, man and hound, we traveled along the contours to a final point where an amazing view of Vancouver was promised and then we humped back to the truck. There wasn’t one dogfight and Mia managed not to snarl at three dogs. Due to the fog, we saw less than more. What we did see were many dogs and owners out on the trail enjoying a day away from the city. I learned that I could head off onto any trail no matter the level and that I always had a back up if there were reports of cougars or bears. I was gaining more confidence and the simple act of walking in the woods was now a source of physical and mental challenges. Though I questioned my own intents and many folks empathized and supported my training of Mia’s “aggressive behavior”. I just grinned and realized that I would rather walk four miles in a Marine’s paws than listen to some hipster’s meaning of life conversations. I was here to let go..to “improvise, adapt and overcome” all the excuses I had used for too long. Oddly enough, I was on a jarhead path toward finding peace within the stillness of these fog coated woods.